A few weeks ago we caught up with actor Jake Gyllenhaal to discuss Source Code, his upcoming film. That was during the SXSW film festival. This past weekend, we got another chance to sit down with the actor, at the film’s LA press day. 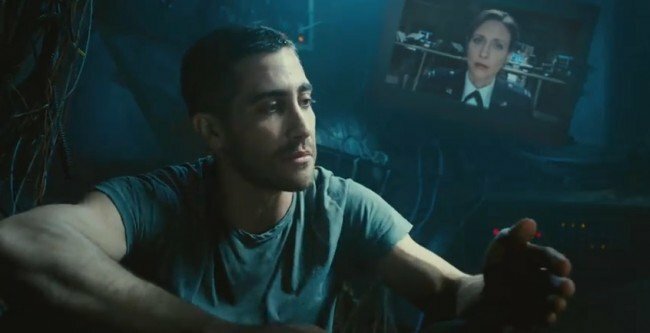 Gyllenhaal plays Colter, an Air Force pilot who wakes up in someone else’s body and must figure out who set off a bomb on a train. He has to re-live the same eight minutes over and over again as part of a new scientific program called the source code. Duncan Jones directs this sci-fi thriller and Michelle Monaghan, Vera Farmiga and Jeffrey Wright co-star. Check out the interview below as Gyllenhaal talks about how the role has has affected his philosophy as well as the experience of being in the Source Code. Audio version included at the end of the page. Question: How did you wrap your mind around the science and the mechanics of the plot? Did you wonder if this would make sense to the audience? Jake Gyllenhaal: The interesting thing about this movie was that the character was parallel with the story and with the audience. So, whatever he was discovering, the audience was going to be discovering to. You see the movie through his eyes. I needed to know first and foremost if the science was conceptually logical, that the idea made sense to me and I bought it. So often, movies like this tend to veer off in a sort of absurdist way. I think about the movie 21 Grams. The idea that in the last 8 minutes of somebody’s life, there’d be electrical impulses that you could kind of usurp and use. It made sense to me thinking that some genius scientists could come up with some computer program that allowed that connection between one body and another body within that period of time. That made it even on a philosophical level make sense to me and it brought up a lot of interesting questions. I also needed to know that when he explained what the source code is that I could have a response that I could not believe and then have to believe. Question: Didn’t you character play with a military mindset? Jake Gyllenhaal: He’s looking at it like an army pilot, but he has tremendous training. He knows not always to trust his instincts. He knows to trust instruments in an emergency. Somehow his instincts kick in. His instincts say “don’t do that”, but then he has to listen to his instruments and keep his cool. Knowing he had to listen to Goodwin, when he says “Goodwin, what do I do”, even though he doesn’t trust her at all instinctually he knows that she’s right. That’s one of my favorite parts of the movie and a brilliant Duncan[Jones] improvisation. We did tons of different takes. I think he trusts his instruments like a pilot would. That’s why he’s a good candidate for the program. Question: As an actor, do you depend on your own instincts when picking projects, because you’ve gone from action to personal stories? Jake Gyllenhaal: No, I never trust my instinct (laughs). The lesson I learned from a famous actress is “I learned never to trust my instincts.” I do. With this movie, I read the script and loved the script, but I knew the movie was not going to be its full potential if it didn’t have a director without the visual confidence, sense of rhythm, had his own voice and at the same time, had a real respect for performers and character. So often with a movie that has so many thrills and tense moments, you can kind of veer off from the character’s story. We needed someone who could be the central part and create more character stories. With this movie, I went completely instinctual. Even when they said “who is the ideal director for you?”, I said Duncan. I loved Moon. I loved meeting Duncan on a general meeting we’d had. I said “if we could get Duncan Jones, he would be the one”. He happened to respond to it. Cosmically, you might say. Question: Who’s more out there, Richard Kelly or Duncan Jones? Did Richard cross your mind when thinking of directors for the film? Jake Gyllenhaal: I thought Duncan may not want to do it because he likes to write what he directs. Richard is the same way. Richard is always doing something interesting and odd and strangely I would love to do something with him that he writes. He’s always on my mind. Duncan is strange though, he always said ‘make it weirder’ to me while on set. I don’t think Richard ever did that. But Richard as a person has more of a mystery than Duncan. Duncan is very enthusiastic, in a different way. When you’re on set with Duncan, he reminds me of Ang Lee, because he’s very calm and quiet and hardly says a thing. What he does is limited and very specific. You might think English is his second language, but it’s not. Question: What do you like to imagine that other Jake Gyllenhaal’s are doing in other quantum realities? Jake Gyllenhaal: I don’t want to imagine what those things might be. Well, I mean what’s amazing about my life experiences so far, choices or regret or triumphs, all those things are the biggest lessons of all. Right now, I’d be running the L.A Marathon if I could be. In other parallel universes, I’d be winning it. Question: Was it difficult as an actor to keep the character fresh going from one eight minute scene to another within the confines of the train? Jake Gyllenhaal: No, I found it an exercise in variations when forced by the constraints of repetition and it was fascinating. It kept mine, Duncan and Michele’s mind always going. Same with budget. When you don’t have as much money to make certain things a certain way, you’re constrained by many things. There’s a big choice by Duncan to not see the father, which I think was a brilliant narrative choice. We also made a choice to make each source code like its own chapter in a book, so each had its own name and intention. The first one was like “Absolute confusion” and the second one was like “The Sim”. In the Sim, I could do anything I want and Duncan would come to me and say “make it weirder”, “don’t buy anybody’s questions.” Each one was its own story and within each story, we could improv and vary it. Michelle could play with the audiences subconscious by switching subtle things and I could deal with the conscious level. Question: Did you make a lot of script changes? Jake Gyllenhaal: The screenplay was so taut and tight and strong when I first read it. It really started to change when Michelle was cast and when Duncan came on. The love story was a big question for all of us, particularly how big is the choice he makes at the end. It was basically a guy who moves from not being able to ask this girl out to coffee to this guy being able to ask this girl out for coffee. And he gets blown up a number of times in the process. It feels like that when you have to ask someone you’re into for coffee (laughs). To take those risks feels like this huge thing so I was involved in those choices. After seeing Michelle in Kiss Kiss, Bang Bang, Duncan and I were like “that’s the Michelle we love.” She’s so extraordinary in that movie. There was a lot of improvisation on that set so she was always ready to go. We created a lot of things from that. It only comes from having a solid script though. Question: Jake, how does a film like this cause your own philosophies to expand? Jake Gyllenhaal: I tend to be a little bit out there in the way I like to look at the world anyway. Working with Duncan and exploring these ideas, when you get to a place where…. particularly the isolating part of the pod, I was talking to myself though a lot of it. Sometimes, I’d have Vera’s voice. Sometimes, I’d have her recorded voice. When it came time to doing it [the scene], I was talking to myself. I was back to being a kid where I’d take a bottle and be like “Hi, this is my friend. ” Whenever you delve into your imagination like that, it expands your mind. To me, it’s a release and a great relief, because it brings you back to that sort of childhood playing. The ideas in this are fantastic though. And that’s a testament to Duncan also, he was open to trying anything. This movie was also made in the editing room, Duncan and Paul Hirsch did a fantastic job. Question: Did the movie make you think what you’d do with less than a minute to live? I wish that there was a computer program that actually existed. I would wish and obviously it’s entertainment, but I would wish that there was a twelve year old kid who’s a brilliant, genius scientist seeing this movie and in the future would go “this movie’s so cool. I wish I could invent something like that”. I want people to be inspired by it. Who knows what we could do? I’d love to go into someone else’s body and be able to warn people before a major catastrophe. If I had a minute to live, I think I would probably call my family and try to have a good laugh. It’s nice to laugh entering and it’s nice to laugh exiting. Question: How did you inject humor in the story? Did it remind you at all of Groundhog Day? Jake Gyllenhaal: That movie happens to be one of my favorite movies. When we thought of the comedy of this movie, we just thought of being with the audience and the questions they might ask. I’m always thinking we need to be one step ahead of the audience. I think that’s what’s brilliant about Duncan’s job and Ben’s script is that they’re always one step ahead of you. Even if you think you found out who the bomber is, you have no idea what’s coming next. So, I love that concept and within that concept there is room for humor. And the humor was a very important part of it. The audience needs to have fun. Question: Can you tell us anything about Nail’d? Jake Gyllenhaal: I don’t know anything about that movie. It’s not within my realm nor is it within David O. Russell’s realm. Neither of us know anything about it. It’s not his movie at this time. I’m doing a movie with David Ayer though where I play an L.A. cop, we start shooting in July. That concludes our interview but we’d like to thank Jake very much for talking with us. Be sure to check out Source Code when it hits theatres on April 1!